How do you gin up global warming fear in a world which hasn't warmed in decades? Thread: How do you gin up global warming fear in a world which hasn't warmed in decades? 'A hot-topic in the media these days has to do with the West Antarctic Ice Shelf (WAIS), a region comprising about 8% of the ice covering Antarctica. Within that region, there are two glaciers that are sliding down to the sea at a steady pace, as glaciers always do. They comprise about 10% of the WAIS, less than 1% of Antarctic ice. This descent has been in progress for several thousand years, and is neither new nor man-caused. It will go on for a few thousand more, after which they’ll be gone. In the parlance of geology, those two glaciers are collapsing. Are you frightened enough over what computer models predict sea level will be in a thousand years to welcome a centrally planned economy? Climate alarmists make major blunder in reporting Antarctica ice loss results: ‘Total ice loss from latest study is ‘consistent’ with, not ‘double’ prior study measurements’ The authors of this latest Antarctica ice loss study estimate that the rate of global sea level rise contributed by their measured Antarctica ice loss results is about 0.45 mm per year which is about the thickness of a human fingernail. Geochemist: Chilling the melting Antarctic hysteria – ‘Thawing of glaciers is historically followed by refreezing’ 'Erosion of Antarctica’s glaciers has proceeded unabated since the end of the last ice age and continued slowly through the past century to the present day. Passage of time, even millennia, would be required before enough ice melted to raise sea levels by the 12 to 13 feet mentioned in recent news accounts, assuming the rate of about 7 inches per century remains constant...Statements suggesting man-made carbon dioxide somehow triggers high-velocity circumpolar winds over the Southern Ocean is speculative for a region already notorious for high winds and treacherous seas. It has been widely reported that “the Antarctic is shedding twice the amount of a few years ago”. I have picked out the Guardian, but the BBC run with the same story, and doubtlessly many others too. Quite simply, the claim is false. The study finds that the new figure is “twice as much as when it was last surveyed”. These are two totally different things. The new Cryosat-2 radar altimeter dataset allows much more detailed analysis, leading to a fivefold increase in the sampling of coastal regions where the vast majority of all ice losses occur. Therefore, most of the newly identified ice loss was happening before, but just was not spotted. Of the figures they quote, by far the largest area, East Antarctica, is only losing 3Gt/year. Given that the margin of error is stated as +/-36, this is effectively zero, and it is quite likely that ice mass is growing there. We need to put these findings into historical perspective. Antarctic land ice has been steadily disappearing since the end of the Ice Age, some 18,000 years ago. Studies show that Antarctic temperatures during the MWP and earlier centuries were comparable with or higher than present. A climate benefit has been discovered in melting ice sheets – ‘Study shows iron from melting ice sheets may help buffer global warming’ A UK team has discovered that summer meltwaters from ice sheets are rich in iron, which will have important implications on phytoplankton growth. The findings are reported in the journal Nature Communications on May 21, 2014. NBC News: Greens envision a day when suicide will not be seen ‘as a stigma of cowardice, or a failure of character, but as altruism in the last ethical act left us’ In the category of “recovering depressed environmentalist,” Bell says he and others like him did have their views shaken by a recent essay titled “The Irreconcilable Acceptance of Near-Term Extinction” by Daniel Drumright of Portland, Oregon. Only 3% of Americans name ‘environment’ as top issue. Where is media balance? Obama admin ADMITS EPA rules shutting down coal plants to RAISE electricity prices by 4% this year and another 13% by 2020 'Already, the current rules are expected to force power companies to shut down 68 coal plants across 20 states between 2014 and 2017, according to Bentek Energy, a market analysis firm. A team of scientists fact checked President Obama on global warming. Share the full rebuttal at scribd: http://www.scribd.com/doc/224538945/NCA-Rebuttal more at http://www.climatedepot.com/. How long can the facts be ignored? Revealed: How green zealots gagged professor who dared to question global warming. 'In a recent key report, the UN Intergovernmental Panel on Climate Change stated the ‘climate sensitivity’ – the amount the world will warm each time carbon dioxide levels in the atmosphere double – was between 1.5C and 4.5C. If a leading climate scientist's research shows the computer models behind the entire global warming scare to be wrong, does that not merit publication in a scientific journal? 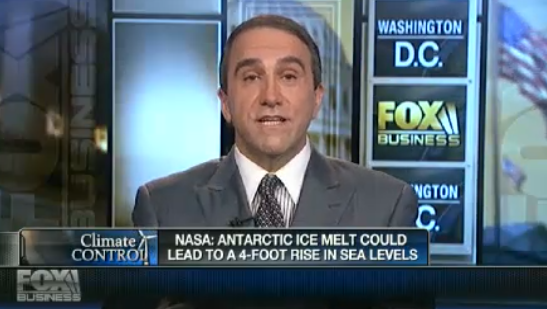 Why the big Antarctic propaganda push and scare assessment? Air cover. EPA is getting ready to hobble America's electricity supply next month with new regulations aimed against existing coal plants. The UN is getting ready to bring the U.S. into its first global warming treaty next year in Paris. The goal is to lock in everything the warming Left wants NOW -- While Obama is still in office. How much damage can be done in the next 32 months?